Who’s Playing the Micro-Mobility Game? Micro-mobility is one of the latest trends to emerge out of the transportation industry. It’s a concept that has gained so much traction that even major automotive players, like Ford and Volkswagen, are getting involved. 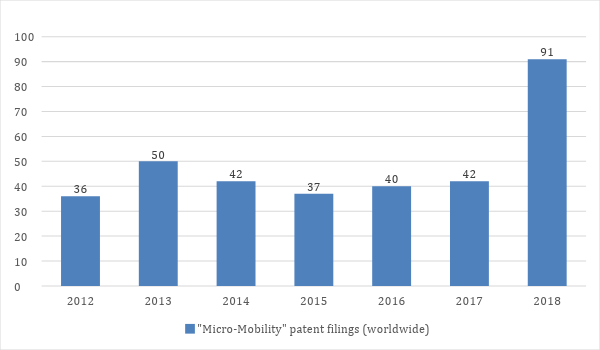 In 2018, micro-mobility took a big step toward going mainstream, with more than double the number of patents filings from previous years. While certain trends never attain scale or sustainability, it looks like micro-mobility is here to stay. It is of global interest – the solutions are affordable, flexible, and environmentally beneficial for high traffic and urban areas – and new companies are popping up around the world. The concept is particularly appealing to city planners and public transit agencies looking to solve the first mile/last mile issue. Even cities with well-established routes understand that providing more options, and thus greater accessibility to trains and busses, will actually increase ridership. Improvements created by micro-mobility have a higher return on investment than building out new bus and train lines. Big city dwellers, one of the major consumer groups of the micro mobility industry, have already bought in and want more. Take Chicago for example. The city has some of the best public transit in the country, and residents and visitors typically rely on the ‘L’, CTA buses and/or the Metra to get around, rather than driving personal cars. However, there is often a lot left to be desired. Dated infrastructure leads to delays, the development of new housing along major routes causes overcrowding, and commuters are left with a headache. The recent influx of ride and bike shares have provided more options and flexibility for commuters. Solving these problems is big enough, and tractable enough, that big companies have taken notice. 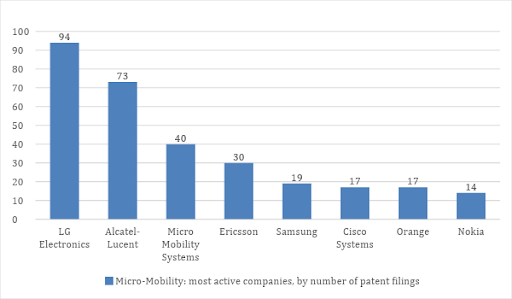 And it’s not just transportation companies: the majority of patents are focused on the networks and software to guide micro-mobility transportation devices. Companies such as LG, Alcatel-Lucent, Ericsson, Samsung, and Cisco Systems all have skin in the game. It may be a number of years before micro-mobility solutions become mainstream in our cities, but the growing level of activity – both among corporations and startups – suggests that it is on the way. Furthermore, it has the potential to generate rippling implications in a variety of industries – from automotive to urban transportation to consumer electronics to digital networking and beyond. If your organization’s industry is connected to personal and urban mobility in any way, watch this space. Your team of scouts may want to develop scenarios and begin looking for promising technologies and significant market entries. Now is the time to prepare for the changes to come.